"Ah, Assistant! You are just in time to join my dimensional anomaly research crew!" Asher Mir is an grumpy Awoken Warlock of the Last City, and a researcher with the Gensym Scribes who specializes in the Vex. "Be safe, Gensym Scribe. A storm is coming. And I will not be at your side when it finds its way to our shores." While researching the Vex, Asher hired two Hunters to accompany him on a mission. They worked well together and continued to function as a fireteam. They eventually attempted to explore the Pyramidion on Io, where they encountered a constantly changing landscape of impossible geometries. Facing stiff resistance, Asher and his team were resurrected by their Ghosts dozens of times before they discovered Brakion, Genesis Mind by the shores of a radiolarian lake in its depths. The Vex Mind experimented on the Guardians by attempting to inject radiolaria and graft Vex technology onto them. They attempted to flee, but as they fought he witnessed a Fanatic explode and rip his Exo Hunter companion in half. Horrified, he frantically reloaded his Fusion Rifle and looked around for his other friend, who then saved Asher by using her Nightstalker bow to destroy ten Vex approaching him. However, four Vex then appeared behind her, and Asher could not bear to watch as they killed her as well. As he searched for a way to escape, a tentacle grabbed his Ghost and he felt a blinding pain in his right arm before passing out. Somehow, Asher and his Ghost survived and escaped the Vex, with Asher's right arm replaced by a Vex's and his Ghost heavily augmented, now possessing an unblinking red eye like a Goblin's. Asher made it back to the Last City but fell into a coma from his wounds, with the Vex arm attempting to infect more of his body. Shortly before his friend Eris Morn disappeared from the City, she visited Asher in the Tower's medical bay and explained that she was leaving to find a way to defeat the Hive outside of the safety of the City. Eris wished him well, sadly noting that she would not be by his side during the City's oncoming struggles. Asher later woke up from his coma, and worked closely with Guardian forces during the Red War, conducting research into the Vex and Taken at the same time from his outpost on Io. "Completely suicidal! The Vex infect whatever they touch. Their self-replication subroutines would consume the Taken from the inside out. Perhaps they simply don't realize the dangers." With the Red War won, Asher and Ikora turned to confronting the other threats that remained on Io. They monitored the Guardian's investigation of reports that the Taken were capturing Vex, and Asher dismissed Ikora's theory that they were attempting to take them, arguing that without a King like Oryx to guide them the Taken had no power to do that. He quickly changed his mind after the Guardian fought Ir Arok, Tongue of Quria, which escaped into a Cabal warbase. Asher informed the others that he could feel something happening to the Vex through his arm, describing it as a presence that wished to rip his essence out of his body, and implored them to stop the Taken quickly. When the Guardian discovered the Vex in Taken prisons, Asher joked that perhaps the Taken had invented law and order, but quickly became serious when the cells converted the Vex into Taken. Asher believed this to be suicidal, as the Vex infected whatever they came in contact with and that their self-replication protocols would consume the Taken. He wondered if the Taken simply did not realize the dangers of Taking the Vex, but Ikora believed they were building an army. Meeting with the Guardian, Asher explained to them that he believed the Taken were going to use the Pyramidion to Take the entire Vex Collective at once using the warp gates within. He noted that he had lost his arm within the Pyramidion, and feared what they would lose if they followed the Taken inside. The Guardian departed for the Pyramidion, which the Taken had already begun infiltrating, and Ikora worried about the devastation that the Taken would unleash should Ir Arok Take the entire collective. Asher responded that losing the Guardian would to the Pyramidion would also be a blow to the Last City and implored his assistant not to venture further into the Pyramidion than required before also asking them not to die. Soon, Asher and Ikora were contacted by the Guardian and learned that Ir Arok was slain, but that some Taken had entered the Pyramidion through a warp gate before it was destroyed. Ikora thanked the Guardian, but Asher stated that he had something that he wished to tell them only in person. When the Guardian arrived at his camp, Asher admitted that when they first met, he assumed the Guardian was useless and that they doubtlessly understood why. However, he admitted to being wrong, and noted that they had survived entering the Pyramidion, although not to the lake where he and his fireteam ventured. Disconcerted, Asher noted the Vex never failed to leave a mark, a fact he was sure the Taken would learn in time, and informed the Guardian that they warranted his further observation. At some point during or after the Red War, the Vanguard organized a Strike mission to infiltrate the Pyramidion and destroy Brakion, Genesis Mind. Asher was a correspondent on this mission, and expressed great enthusiasm at the opportunity to see his Vex nemesis defeated. 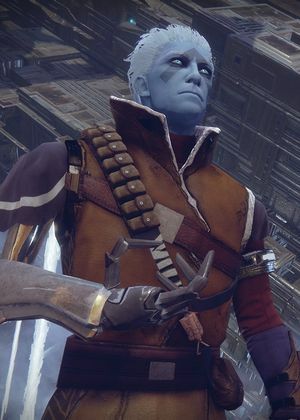 A year after the Red War, Cayde-6 was murdered by Prince Uldren Sov of the Reef while on a mission to the Prison of Elders with the Young Wolf. Asher heard of his death, and when the Young Wolf next visited him, Asher noted that his fireteam's expedition into the Pyramidion had been motivated by greed and self-interest and had exacted a heavy and continuing price. Asher suggested that Cayde's pride had led him into paying a similar price within the Prison of Elders, and cautioned the Young Wolf about letting their desire for vengeance making them pay another price of their own. "Asher can't figure out where you are. If he drops out, it's because he's thrown a tantrum and broken his microphone." "I heard that, you wretch! "Mmm. He feels safe saying such things because he is on Io and I am not." Asher Mir's personality is prickly, as Ikora Rey was noted to have been exasperated with him, while Eris Morn regards him as a kindred spirit and a friend. They related to each other on being changed by alien enemies. He tried to help her with her research on Nokris, but unfortunately found nothing. He is a very whimsical, narcissistic and eccentric individual, not particularly caring for the safety of the subjects that he sends out for research duties. He strongly values evidence and careful planning and has little regard for people who act impulsively or relying on faith. He has particular disdain for Titans, thanks to their "punch first, study later" habits. Though Asher prefers to remain in solitude with his research, he does allow some people to "assist" him and when he is forced to interact with people, he prefers the company of fellow Warlocks. Ghost even wonders how his original fireteam was able to work well with him, given his behavior. While his experiences with the Vex have Asher fixed on the alien machines, he is driven out of sense of revenge and scientific understanding, not out of a dangerous obsession to learn the Vex's secrets. As such, while unnerving, his studies on the Vex isn't as dangerous as Osiris' obsessions with the Vex or even Toland, whose morbid fascination with the Hive led to his exile. His one true obsession may simply be science itself. At times, Asher tends to call the Guardian his "assistant" and tends to give them dangerous missions to aid his studies on the Vex and Taken, not particularly caring for their safety and even when they succeed and aid in his research, he doesn't even show gratitude. Even the Guardian's Ghost finds Asher infuriating at times but can't deny his expertise in science. Despite his disrespect for the Guardian, their efforts and success throughout the Red War granted them a morsel of respect from Asher. He even grows slightly concerned for their safety during their missions involving The Pyramidion, not wanting them to go through what he did, but aids them in destroying Brakion, Genesis Mind. Following Cayde-6's death at the hands of Uldren Sov, Asher notes that he paid a price for his curiosity and self-interest in the Pyramidion, and warns that the Guardian's quest for vengeance will be met with an equal and opposite reaction, a sentiment echoed by Zavala later on. Asher has an overall bad habit of explaining situations and certain topics using advanced scientific definitions, leaving many confused and forcing him to simplify his answers, annoying him considerably. Additionally, when faced with a conundrum he can't fathom or figure out, Asher tends to act childishly, throwing temper tantrums or refuses to acknowledge that he can't figure it out, as noted by Ikora. Despite this, Asher will, albeit grudgingly, admit when his analyses are incorrect. His surliness may be in part be driven by a deep-seated anxiety regarding his gradual assimilation by the Vex, and his frustration that all his efforts to halt it have failed. Similarly, Asher possesses a great deal of guilt for what happened to his Ghost during his original mission in the Pyramidion. He attempted to cure her condition but failed and thought about ending his Ghost to spare her from the Vex torment, though he couldn't bring himself to do it. Asher therefore considers himself a coward for that. "If only I had more time..."
"...Ever-spiraling complexity... Yes, their simulations are potentially limitless!" " I have not been reborn since the accident. In truth, I do not know what would happen. Is my Ghost even capable of such a thing anymore?" "These calculations would astonish even the most hardened of Cryptarchs!" "Every iteration of the Collective nets me more data; I need more information!" "Perhaps if I just... no! I will NOT suffer ambiguity with this work!" "I see your point Sloane. What I fail to see is how resistance problems on Titan affect me out here." "What could you possibly want?" "Dead Orbit's philosophy is the one true way; I'm convinced now. Our future lies beyond these stars... somewhere." "What? NO! Cayde, there is nothing you could teach me about the Vex that I would want to know!" "Dead Orbit had the right of it. System's doomed." "Yes, Arach. I'm willing to pass along my data if you think it will get us out of this graveyard of a system." "Are we having a 'moment'?" "I'm so close... if I can just--Gah!" "If my calculations are correct--QUIET YOU!" "You're not hearing me, Sloane! There's nothing to suggest--I DON'T KNOW! Get somebody to explain the big words to you!" "It doesn't hurt; not really. My nerve endings have transformed where they meet with the biocircuitry. Doesn't matter when i'm dreaming, though..."
"You're imagining it! You don't feel the micromachines in your tendons... it's your mind playing tricks on you..."
"If you are staring at my arm, LEAVE!" "I am not a museum specimen!" "This is why I work alone." "Ugh, so once again I must endure the TORTURE of 'collaborative science'." "Did Cayde ask you to bother me?" "I am annoyed, and I am armed." "It's hard to calculate with you just STANDING there!" "Experiment 922: Planning: Radiolarian fluid and exposure to high heat." "Are you seriously telling me that you have access to a Golden Age AI... and you're letting it just SIT THERE!? WHAT'S WRONG WITH YOU!?" "There's no pit in the Pyramidion!" "Spare me your pity, Guardian. I stand before you of sound mind and filled with intellectual fury. What is there to pity?" "I have considered ending my Ghost. None of my research indicates a way to extricate the vex technology from it's shell. This is how I know I'm a coward; because I cannot bring myself to..."
"Despite how it may seem, I regret what happened to my Ghost. I chose to enter the Pyramidion. He just... had my back." "Warlock, don't let them see you blink." "My condition has spread to my lungs. I fear my heart is next." "Use your studies well, Warlock." "I know what I'm still doing out here. But you Sloane? What are you still doing on Titan? On some sort of secret mission are you?" "It's remarkable how a ticking clock can focus your vision. Redefine what is and is not important." "So I outlived another one eh? Wouldn't have thought it." "I uh, really should show my appreciation to Ikora more often. She has been very supportive since the incident. Moreover given my disposition." "I don't see how that's relevant!" "Experiment 1008: Radiolarian fluid and exposure to EVEN HIGHER HEAT! TAKE THAT YOU MISERABLE GOOP!" "What are you into now?" "That will have to do." "The price is right. I suppose." "The purchase will suffice. I hope." "Your lackluster attitude reminds me of.. eugh nevermind. I can concentrate again." "Science waits for no one!" "The suspense is killing me. Oh wait! Thats the Vex." "PATHETIC OLD FOOL! Can't solve the Radioloria Origin problem in order to... Quite Literally, SAVE YOUR OWN DAMN LIFE!" "DO NOT TEST MY PATIENCE!" "Ah just because I'm Awoken. I have never been to the Reef Serfen." "Any word from the Reef? Strictly professional curiosity of course." "Are you satisfied from your quest for vengeance?" "After the accident, my fireteam did all they could to help. But everything they did reminded me of that day. I wonder... I wonder if they survived the attack on the city?" "It strikes me, not for the first time, that Guardians are uniquely ill equipped for grief. We spend much of our formative years thinking we are impervious to it. But... well look at us." "The more I study the Vex the more I believe they are not guided by true purpose. They are just blind entropy, we ascribe them false intent." "The Vex are beautiful. The simplicity of even the basis Goblin, the purposeful design. I still admire them... in a way." Asher serves as the vendor and one of the main questgivers for Io. He is situated in The Rupture. Turning in Io tokens, Phaseglass Needles and Phaseglass Spires increases player reputation with Asher Mir and rewards legendary faction gear, shaders and other rewards. Man O' War - upon completion of the Io World Quest. Eris Morn calls him a "Gensym Scribe", a rank or even another name. Gensym Lisp is a programming language, with "gensym" short for generate symbol. In this case, Asher's title means he has a new name, speaking to his catatonia from submersion in Vex technology. Alternatively, "gensyn" is a Danish word meaning "reunion". Asher's Vex condition is similar to Kabr's as both could feel the Vex's presence intruding on their bodies (or mind in Kabr's case). Asher knows that unless he can cure his condition, over time he will die. Judging from his quotes, Asher appears to be a supporter of the Dead Orbit Faction, as he finds the Solar System at times to be a lost cause.